This post is about the seventh of seven principles of magic that were laid out in The Kybalion. You may wish to read the principles of correspondence, mentalism, vibration, cause and effect, and polarity. The Kybalion, purportedly based upon ancient Hermeticism, was first published in 1908. The Kybalion itself claims to have influenced all major religions and philosophies, both ancient and modern. So we know everything vibrates because of the Principle of Vibration. The Principle of Rhythm tells us that these vibrations are not random. Everything in this world has an order. In nature we see rhythm in the changes of season, the phases of the lunar cycle, the beats of a heart, the stages of development, and countless other patterns. To get a better understanding of how The Principle of Rhythm works, think about a pendulum. A pendulum swings to the right, and then it swings back to the left. It keeps swinging like this, back and forth, back and forth, in rhythm Without friction, the pendulum will go on swinging, infinitely. The energy in the universe is like a pendulum: swaying, flowing, swinging back and forth. Everything is either growing or dying. Thinking about what you want from your life. If you haven't already, you may wish to read Know Thyself, What is a Witch? before continuing. You'll also want to reflect on the other principles of magic: correspondence, mentalism, vibration, cause and effect, and polarity. To keep your thoughts organized, take a sheet of paper and fold it in half to create two columns. Title the first column, “Future Spells” and the second column, “Moon Phase”. Or—better yet—you can download a printable worksheet... for FREE. Just scroll, down, sign up, and get to work! Think of types of spells you might cast to achieve your goals. Assign a phase of the moon to each item as a road map for when you want to cast these spells. As a reminder, you are the most important part of your craft. You can cast a spell at any time and your will alone can bring it into being. 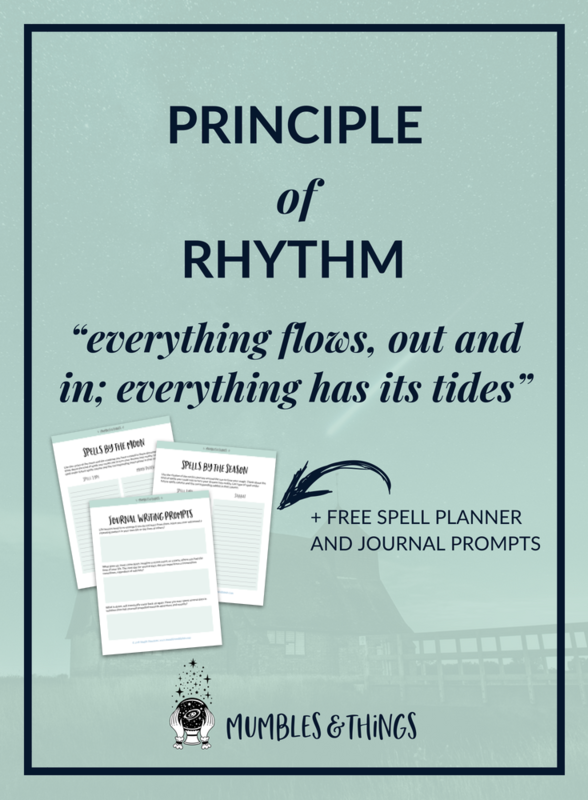 The phases of the moon (and other tools we will look at later) can bring more power and energy to your spells, which may make them work faster. Save your worksheet as a plan for your future spells. I know, it’s starting to feel like real magic, isn’t it? You can feel it can’t you, it’s about to get really, really good. 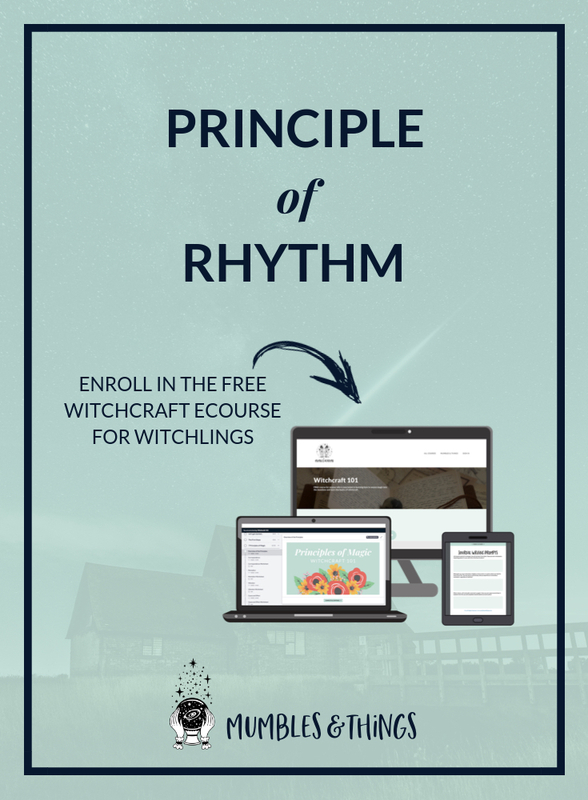 This content is part of my FREE ecourse called Witchcraft 101. Click the button below to enroll and access the video lessons and workpages that are designed to help you understand and learn to control your innate power. It's Time to build a foundation for your magic and grow your self confidence so that your magic works more consistently. Tell me about your experiences and perspectives on the Mumbles and Things Facebook page or comment below. Giving Back: 10 Things You Can Do To #SavetheBees!